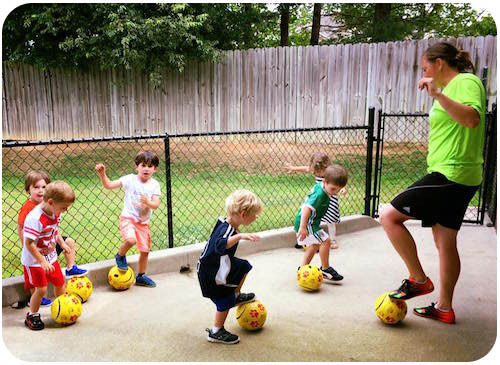 HappyFeet classes are age specific, fun soccer fitness classes that utilize creative engaging children's games, stories and songs to teach soccer skills, improve fitness, develop balance and enhance coordination. HappyFeet Triangle classes are held at daycares, preschools, churches and mother's day out facilities throughout Raleigh, Durham, Chapel Hill and the greater Triangle region. Classes are offered both during the traditional day and as an exciting after school program. Classes can be performed both inside and out. 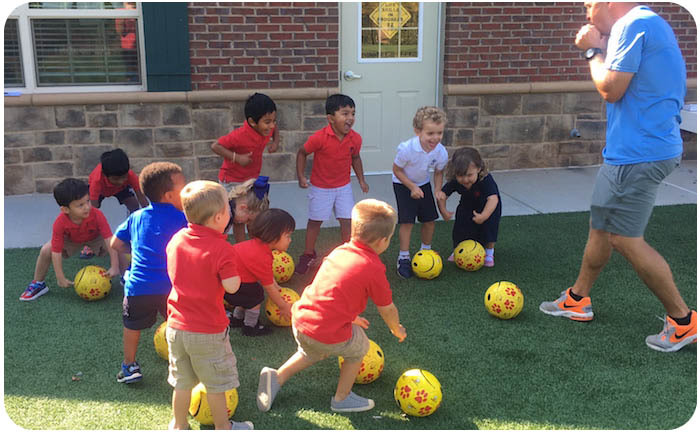 Some of the common spaces used for HappyFeet soccer classes include medium to large classrooms, lunchrooms, gymnasiums and outdoor playgrounds. The flexibility allows us to never cancel class due to weather. Help Kids Focus - Because HappyFeet classes involve stories, songs, balls, and dynamic play, children absolutely love every minute. A happy child who has satisfied their inherent genetic need to move is better able to focus, concentrate on and maximize benefits from other aspects of the school curriculum. Rebates for Schools - HappyFeet offers percentage rebate back to the school. Many schools use this extra money for supplies and/or supplies to place in the teacher resource room. HappyFeet is responsible for all the work and sees itself as a complement to the school rather than "another drain on the school's resources." Build Staff Loyalty - Staff kids enjoy HappyFeet class for a discounted rate. Staff kids attending class is just another perk keeping your staff happy with their job!